Young Growers Alliance A few weeks ago, Ben Wenk, a seventh generation farmer at Three Springs Fruit Farm in Adams County, PA, reached out to the National Young Farmers Coalition about opportunities to collaborate with the Young Growers Alliance, an organization he currently chairs. Talking with Ben about the YGA bled into a conversation about how the organization shaped his own experience returning to become a partner in his family’s farm. The Wenks have farmed in Adams County since 1918. Ben’s grandfather transitioned from a more diversified farm into a fruit focused farm, building on the apple orchards planted by Ben’s great-great-grandfather. At one point the farm grew entirely processing apples for Knouse Foods, and in the past 20 years has moved towards more fresh fruit, planting cherries and pears and peaches and apples and apricots. Since Ben returned in 2007, the farm has begun direct marketing through farmers markets and growing more small fruits and vegetables. Ben pursued music in high school and considered music education as a career, but as he looked at colleges, he decided to return to the farm. After he graduated from Penn State with a degree in Agroecology and a minor in Horticulture, Ben got an e-mail from the Young Growers Alliance about a farmers market opening in Philadelphia. He saw farmers markets as “something he could really bring and add to the business,” and “an opportunity to come back and contribute something.” In the Young Growers Alliance, Ben found both community and a safe place for information sharing: he was “able to learn and see new things and ask questions about growing practices without second guessing the validity of my questions.” Elected Chair of the organization for 2011, Ben plans to continue the important work of supporting young people in their farming careers. 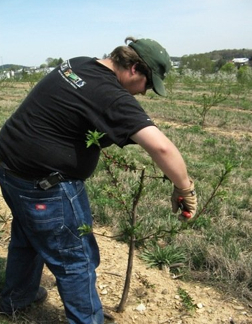 Formed in Adams County PA in 2005 as a “coalition of specialty crop growers at the start of their horticulture careers,” the Young Growers Alliance hosts field trips, workshops and other programs to help young growers attack the challenges they face in their work. Major initiatives include farm transition planning, sharing diversification and marketing ideas, exploring innovative production techniques, recruiting and encouraging young horticulture students, and developing the leadership capacity of the next generation of fruit growers. As Ben tells it, the organization began “when Sidney Kuhn, of Kuhn Orchards in Adams County, had been back from college for awhile, it occurred to her that there were lots of next generation fruit growers but they didn’t really know each other. The older generation knew each other, or at least of each other, and some of the kids knew each other in high school, but in high school … we sure weren’t talking about growing.” YGA was formed to forge relationships between this new generation of farmers through field trips specifically for young people. Adams County is in the top five counties nationally in terms of number of apple growers, and the membership of the YGA reflects that history. Most of the 150+ members are, like Ben, next generation growers returning to become part of their families orchard businesses. However, membership is expanding as young people in similar circumstances hear about the YGA through their trips or networking. Membership is growing from other regions of the U.S. and even internationally. The YGA receives some funding from the State Horticultural Association of Pennsylvania (SHAP) and the Maryland Horticultural Society, but most of the group’s functioning takes place without a formal budget. Activity centers around the list-serv, and members and farmers volunteer or donate to host events. When the group travels (and they’ve taken some pretty big trips! ), funding comes piecemeal: one farm might pay for a night’s accommodations in a hotel, another might pay for a rental car. YGA members have traveled to upstate New York, Washington State and two international destinations: New Zealand and Italy. 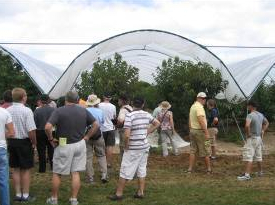 New Zealand fruit farmers grow in circumstances opposite to YGA farmers in the Mid-Atlantic: apple trees mature three times as fast, but 95 percent of fruit is grown for export; there are no major populations to buy produce. YGA leaders Matt and Mary Harsh lived in New Zealand while Matt studied for his masters degree, so they set up a whirlwind tour of 20+ farms and agricultural businesses. Learning about the strategies growers use to establish markets for themselves inspired Ben and other YGA members. “If I had customers in my backyard, they told us, I wouldn’t get up ‘till noon!” As with many YGA trips, the whole group was motivated and invigorated to come home and try new things on our farms. How is the YGA involved in farm transition? How has the YGA helped young growers? Another shift Ben is beginning to see members take on their families’ farms is in starting to transition to more sustainable farming practices. At Three Springs Farm, Ben took IPM practices already in place when he returned to the farm, and with a few changes and added documentation, applied for Food Alliance Certification. “Food Alliance is a certification that keeps raising the bar. We have one year, three year and five year goals. For us, specific examples we have laid out include establishing plantings of wildflowers in our orchards to encourage wild pollinators, putting a year of fallow into our crop rotation when we take out an orchard to recondition the soil and building bat boxes around our ponds.” Although he has yet to convince any other YGA members to “take the plunge,” the way Ben talks about the goals Food Alliance Certification requires farms to set sounds in many ways analogous to the goals YGA members set for their farms and their roles on the farm. Ben hopes to share his knowledge about this process with other YGA members in the future. Ben credits the YGA with his major role on the farm coordinating all farmers’ markets and direct marketing. October 2010’s Good Fruit Grower Magazine generalizes that Ben’s experience of adding a farmers market component to the business isn’t uncommon: “Many [young growers] are coming into the family business in the marketing end, rather than production. They have a keen interest in direct marketing through farms and farmers’ markets and often relate very well to customers.” Ben was inspired to begin a transition towards more fresh fruit for retail and direct marketing to customers after talking with Matt Harsh of Chesley Vegetable Farms in Smithburg MD about his experience at DC area farmers markets. YGA helped the transition come together logistically as well: Ben rented Corey McCleaf’s cold storage before Three Springs invested in their own. What are the next steps for the YGA? Interested in joining the YGA? To learn more about the YGA, and to become a member, check out the Web site. Membership is free and, on a skeletal level, consists of an e-mail list-serv and invitations to YGA events and workshops, where members begin the process of working together. But that’s only the beginning; as described above, the muscles of the organization are large and growing.